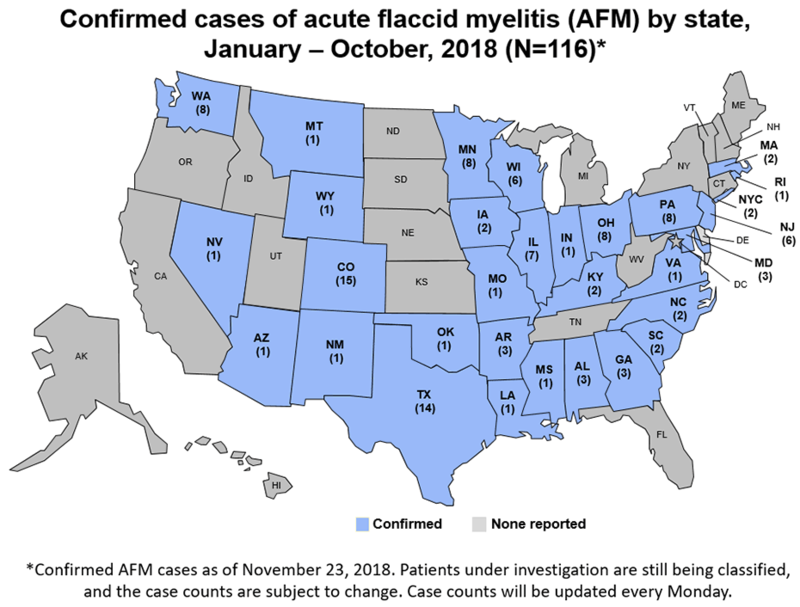 In an update on the acute flaccid myelitis (AFM) situation in the US this year, the Centers for Disease Control and Prevention (CDC) reports an additional 10 confirmed cases, bringing the total to 116 confirmed cases of AFM in 31 states. These 116 confirmed cases are among the total of 286 reports that CDC received of patients under investigation (PUIs). Colorado and Texas have reported the most confirmed cases with 15 and 14, respectively. Washington, Minnesota, Ohio and Pennsylvania have seen eight cases each. 2018’s numbers are comparable to recent years–2014 (120 cases from 34 states) and 2016 (149 confirmed cases in 39 states and DC). To date, the cause of these cases still evades health officials. North of the border, Canadian health officials have reported 25 confirmed AFM cases to date and another 23 cases are under investigation. Acute flaccid myelitis (AFM) is a rare but serious condition. It affects the nervous system, specifically the area of the spinal cord called gray matter, which causes the muscles and reflexes in the body to become weak.